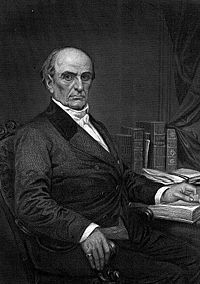 Daniel Webster (January 18, 1782 – October 24, 1852) was a leading American statesman during the nation's antebellum era. Webster first rose to regional prominence through his defense of New England shipping interests. His increasingly nationalistic views and the effectiveness with which he articulated them led Webster to become one of the most famous orators and influential Whig leaders of the Second Party System. As an attorney he served as legal counsel in several cases that established important constitutional precedents that bolstered the authority of the Federal government. As Secretary of State, Webster negotiated the Webster-Ashburton Treaty that established the definitive Eastern border between the United States and Canada. Primarily recognized for his Senate tenure, Webster was a key figure in the institution's "Golden Age." So well-known was his skill as a Senator throughout this period that Webster became a third of what was and still is known today as the "Great Triumvirate," or the "Immortal Trio," along with his colleagues Henry Clay and John C. Calhoun. Like Henry Clay, his desire to see the Union preserved and conflict averted led him to search out compromises designed to stave off the sectionalism that threatened war between the North and South. Though Webster made three bids he never achieved the Presidency, his final attempt failing in part because of his compromises. Like his attempts at gaining the White House, Webster's efforts to steer the nation away from civil war toward a definite peace would ultimately prove futile. Despite this, Webster came to be esteemed for his attempts, and was officially named by the Senate in 1957 as one of its five most outstanding members. Daniel Webster was born January 18, 1782 to Ebenezer and Abigail Webster (née Eastman) in Salisbury, New Hampshire. He and his other nine siblings were raised on his parents' farm, a small parcel of land granted to his father in recognition of his service in the French and Indian War. As Daniel was a “sickly” child, his family indulged him, exempting him from the harsh rigors of eighteenth century New England farm life. Though uneducated, Ebenezer Webster was made a judge on the local court in 1791, a position which carried a salary of four hundred dollars; the Elder Webster resolved to use this money to educate young Daniel. After attending local schools for most of his life, Daniel Webster was subsequently enrolled at the Phillips Exeter Academy at age 14. There the other boys laughed at his rustic clothing and mannerisms. After nine months at Phillips, the Websters were unable to meet the academy's costs and were forced to bring Daniel home. He studied under a private tutor until the summer of 1797, when he enrolled at Dartmouth College. Dartmouth had a mandatory declamation class, and he also practiced the art of oratory at the United Fraternity Literary Society. This helped him overcome his fear of public speaking, instigated by the ridicule of his schoolmates. This training helped him develop his mature, classicizing style. According to John F. Kennedy, Webster could "think out a speech, sentence by sentence, correct the sentences in his mind without the use of a pencil, and then deliver it exactly as he thought it out." Webster soon became known throughout Hanover as an orator and in 1800 he was invited to give an oration at their Independence Day celebration. Dartmouth graduated Webster as a member of Phi Beta Kappa in 1801. After graduation, Webster was apprenticed to the lawyer Thomas W. Thompson. Webster was forced to resign and become a schoolmaster (as young men often did then, when public education consisted largely of subsidies to local schoolmasters), when his older brother's own quest for education put a financial strain on the family that consequently required Webster's support. When his brother's education could no longer be sustained, Webster returned to his apprenticeship. Webster left New Hampshire, enter the employ of prominent Boston attorney Christopher Gore in 1804. While clerking for Gore—who was involved in international, national, and state politics—Webster educated himself on various political subjects and met other New England politicians. In 1805 Webster was accepted into the bar, returning to New Hampshire to set up a practice in Boscawen, in part to be near his ailing father. During this time, Webster took a more active interest in politics. Raised by an ardently Federalist father and taught by a predominantly Federalist-leaning faculty at Dartmouth, Webster, like many New Englanders, supported Federalism. Accordingly, he accepted a number of minor local speaking engagements in support of Federalist causes and candidates. After his father's death in 1806, Webster handed over his practice to his older brother, Ezekiel, who had by this time finished his schooling and been admitted to the bar. Webster then moved to the larger town of Portsmouth in 1807, opening a practice there. During this time the Napoleonic wars began to affect Americans as Britain, short of sailors, strengthened its navy by impressing American sailors thought to be British deserters. President Jefferson retaliated with the Embargo Act of 1807, ceasing all trade to both Britain and France. As New England was heavily reliant upon commerce with the two nations, Webster, like many in the region, vehemently opposed Jefferson's attempt at "peaceable coercion." He wrote an anonymous pamphlet attacking it. Eventually the trouble with England escalated into the War of 1812. That same year, Daniel Webster gave an address to the Washington Benevolent Society, an oration that proved critical to his career. The speech decried the war and the violation of New England's shipping rights that preceded it, but it also strongly denounced the extremism of those more radical among the unhappy New Englanders who were beginning to call for the region's secession from the Union. The Washington oration was widely circulated and read throughout New Hampshire, leading to Webster's 1812 selection to the Rockingham Convention, an assembly that sought to formally declare the state's grievances with President Madison and the federal government. There, he was a member of the drafting committee and was chosen to compose the Rockingham Memorial to be sent to Madison. The report included much of the same tone and opinions held in the Washington Society address, except that, uncharacteristic for its chief architect, it alluded to the threat of secession saying, "If a separation of the states shall ever take place, it will be, on some occasion, when one portion of the country undertakes to control, to regulate, and to sacrifice the interest of another." "The Administration asserts the right to fill the ranks of the regular army by compulsion...Is this, sir, consistent with the character of a free government? Is this civil liberty? Is this the real character of our Constitution? No sire, indeed it is not…. Where is it written in the Constitution, in what article or section is it contained, that you may take children from their parents from their children, and compel them to fight the battles of any war in which the folly or the wickedness of government may engage it? Under what concealment has this power lain hidden which now for the first time comes forth, with a tremendous and bailful aspect, to trample down and destroy the dearest rights of personal liberty? Webster's efforts on behalf of New England Federalism, shipping interests, and war opposition resulted in his election to the House of Representatives in 1812, where he served two terms ending March 1817. He was an outspoken critic of the Madison Administration and its wartime policies, denouncing its efforts at financing the war through paper money and opposing Secretary of War James Monroe's conscription proposal. Notable in his second term was his support of the reestablishment of a stable specie-based national bank; but he opposed the tariff of 1816 (which sought to protect the nation's manufacturing interests) and House Speaker Henry Clay's American System. After his second term, Webster did not seek a third, choosing his law practice instead. In an attempt to secure greater financial success for himself and his family (he had married Grace Fletcher in 1808, with whom he had four children), he moved his practice from Portsmouth to Boston. Webster had been highly regarded in New Hampshire since his days in Boscawen, and had been respected throughout the House during his service there. He came to national prominence, however, as counsel in a number of important Supreme Court cases. These cases remain major precedents in the Constitutional jurisprudence of the United States. In 1816, Webster was retained by the Federalist trustees of his alma mater, Dartmouth College, to represent them in their case against the newly elected New Hampshire Republican state legislature. The legislature had passed new laws converting Dartmouth into a state institution, by changing the size of the college's trustee body and adding a further board of overseers, which they put into the hands of the state senate. New Hampshire argued that they, as successor in sovereignty to George III of the United Kingdom, who had chartered Dartmouth, had the right to revise the charter. "This, sir, is my case. It is the case not merely of that humble institution, it is the case of every college in our land... Sir, you may destroy this little institution; it is weak; it is in your hands! I know it is one of the lesser lights in the literary horizon of our country. You may put it out. But if you do so you must carry through your work! You must extinguish, one after another, all those greater lights of science which for more than a century have thrown their radiance over our land. It is, sir, as I have said, a small college. And yet there are those who love it!" Webster argued Dartmouth College v. Woodward to the Supreme Court (with significant aid from Jeremiah Mason and Jeremiah Smith), invoking Article I, section 10 of the Constitution (the Contract Clause) against the State. The Marshall court, continuing with its history of limiting states rights and reaffirming the supremacy of the Constitutional protection of contract, ruled in favor of Webster and Dartmouth, 3–1. This decided that corporations did not, as many then held, have to justify their privileges by acting in the public interest, but were independent of the states. Other notable appearances by Webster before the Supreme Court include his representation of James McCulloch in McCulloch v. Maryland (1819), the Cohens in Cohens v. Virginia, and Aaron Ogden in Gibbons v. Ogden (1824), cases similar to Dartmouth in the court's application of a broad interpretation of the Constitution and strengthening of the federal courts' power to constrain the states, which have since been used to justify wide powers for the federal government. Webster's handling of these cases made him one of the era's foremost constitutional lawyers, as well as one of the most highly paid. 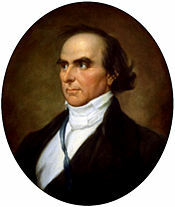 Daniel Webster's growing prominence as a constitutional lawyer led to his election as a delegate to the 1820 Massachusetts Constitutional Convention. There he spoke in opposition to universal suffrage (for men), on the Federalist grounds that power naturally follows property, and the vote should be limited accordingly; but the constitution was amended against his advice. He also supported the (existing) districting of the State Senate so that each seat represented an equal amount of property. Webster’s performance at the convention furthered his reputation. Joseph Story (also a delegate at the convention) wrote to Jeremiah Mason following the convention saying "Our friend Webster has gained a noble reputation. He was before known as a lawyer; but he has now secured the title of an eminent and enlightened statesman." Webster also spoke at Plymouth commemorating the landing of the Pilgrims in 1620; his oration was widely circulated and read throughout New England. He was elected to the Eighteenth Congress in 1822, from Boston. In his second term, Webster found himself a leader of the fragmented House Federalists who had split following the failure of the secessionist-minded 1814 Hartford Convention. 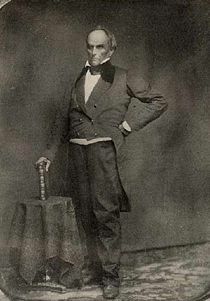 Speaker Henry Clay made Webster chairman of the Judicary Committee in an attempt to win his and the Federalists' support. His term of service in the House between 1822 and 1828 was marked by his legislative success at reforming the United States criminal code, and his failure at expanding the size of the Supreme Court. He largely supported the National Republican Adams administration, including Adams' candidacy in the highly contested election of 1824 and the administration's defense of treaty sanctioned Creek Indian land rights against Georgia's expansionist claims. While a Representative, Webster continued accepting speaking engagements in New England, most notably his oration on the fiftieth anniversary of Bunker Hill (1825) and his eulogy on Adams and Jefferson (1826). With the support of a coalition of both Federalists and Republicans, Webster's record in the House and his celebrity as an orator led to his June 1827 election to the Senate from Massachusetts. His first wife, Grace, died in January 1828, and he married Caroline LeRoy in December 1829. When Webster returned to the Senate from his wife's funeral, in March 1828, he found the body considering a new tariff bill, the Tariff of Abominations, that sought to increase the duties on foreign manufactured goods on top of the increases of 1824 and 1816, both of which Webster had opposed. Now however, Webster changed his position to support a protective tariff. Explaining the change, Webster stated that after the failure of the rest of the nation to heed New England's objections in 1816 and 1824, "nothing was left to New England but to conform herself to the will of others," and since they were consequently heavily invested in manufacturing, he would not do them injury. It is the more blunt opinion of Justus D. Doenecke that Webster's support of the 1828 tariff was a result of "his new closeness to the rising mill-owning families of the region, the Lawrences and the Lowells." Webster also gave greater approval to Clay's American System, a change that along with his modified view of the tariff brought him closer to Henry Clay. The passage of the tariff brought increased sectional tensions to the U.S., tensions that were agitated by then Vice President John C. Calhoun's promulgation of his South Carolina Exposition and Protest. The exposition espoused the idea of nullification, a doctrine first articulated in the U.S. by Madison and Jefferson. It held that states were sovereign entities and held ultimate authority over the limits of the power of the federal government and could thus "nullify" any act of the central government it deemed unconstitutional. While for a time the tensions increased by Calhoun's exposition lay beneath the surface, they burst forth when South Carolina Senator Robert Young Hayne opened the 1830 Webster-Hayne debate. By 1830, Federal land policy had long been an issue. The National Republican administration had kept land prices high. According to Adams' Secretary of the Treasury Richard Rush, this served to provide the federal government with an additional source of revenue, but also to discourage westward migration that tended to increase wages through the increased scarcity of labor. Senator Hayne, in an effort to sway the west against the north and the tariff, seized upon a minor point in the land debate, accusing the north of attempting to limit western expansion for their own benefit. As Vice President Calhoun was presiding officer over the Senate but could not address the Senate in business; James Schouler contended that Hayne was doing what Calhoun could not. The next day, Webster, feeling compelled to respond on New England's behalf, gave his first rebuttal to Hayne, highlighting what he saw as the virtues of the North's policies toward the west and claiming that restrictions on western expansion and growth were primarily the responsibility of southerners. Hayne in turn responded the following day, denouncing Webster's inconsistencies with regards to the American system and personally attacking Webster for his role in the so called "corrupt bargain" (on tariffs) of 1824. The course of the debate strayed even further away from the initial matter of land sales with Hayne openly defending the "Carolina Doctrine" of nullification as the doctrine of Jefferson and Madison. When my eyes shall be turned to behold for the last time the sun in heaven, may I not see him shining on the broken and dishonored fragments of a once glorious Union; on States dissevered, discordant, belligerent; on a land rent with civil feuds, or drenched, it may be, in fraternal blood! Let their last feeble and lingering glance rather behold the gorgeous ensign of the republic... not a stripe erased or polluted, nor a single star obscured, bearing for its motto, no such miserable interrogatory as "What is all this worth?" nor those other words of delusion and folly, "Liberty first and Union afterwards"; but everywhere, spread all over in characters of living light, blazing on all its ample folds, as they float over the sea and over the land, and in every wind under the whole heavens, that other sentiment, dear to every true American heart,—Liberty and Union, now and for ever, one and inseparable! On January 26, Webster gave his Second Reply to Hayne, in which Webster openly attacked nullification, negatively contrasted South Carolina's response to the tariff with that of his native New England's response to the Embargo of 1807, rebutted Hayne's personal attacks against him, and famously concluded in defiance of nullification (which was later embodied in John C. Calhoun's declaration of "The Union; second to our liberty most dear! "), "Liberty and Union, now and for ever, one and inseparable!" While the debate's philosophical presentation of nullification and Webster's abstract fears of rebellion would be brought into reality in 1832 when Calhoun's native South Carolina passed its Ordinance of Nullification, Webster supported Andrew Jackson's plan to send U.S. troops to the borders of South Carolina and the Force Bill, not Henry Clay's 1833 compromise that would eventually defuse the crisis. Webster thought Clay's concessions to be dangerous, further emboldening the south and legitimizing its tactics. Especially unsettling was the resolution affirming that "the people of the several States composing these United States are united as parties to a constitutional compact, to which the people of each State acceded as a separate sovereign community." The usage of the word accede would, in his opinion, lead to the logical end of those states' right to secede. Since I have arrived here [in Washington], I have had an application to be concerned, professionally, against the bank, which I have declined, of course, although I believe my retainer has not been renewed or refreshed as usual. If it be wished that my relation to the Bank should be continued, it may be well to send me the usual retainers. At the same time however, Webster, like Clay, opposed the economic policies of Andrew Jackson, the most famous of which was Jackson's campaign against the Second Bank of the United States in 1832, an institution that held Webster on retainer as legal counsel and whose Boston Branch he directed. Clay, Webster, and a number of other former Federalists and National Republicans united as the Whig Party, in defense of the Bank against Jackson's intention to replace it. There was an economic panic in 1837, which converted Webster's heavy speculation in mid-western property into a personal debt from which Webster would never recover. His debt was exacerbated by his propensity for living "habitually beyond his means," lavishly furnishing his estate and giving away money with "reckless generosity and heedless profusion," in addition to indulging the smaller scale "passions and appetites" of gambling and alcohol. In 1836, Webster was one of three Whig party candidates to run for the office of President, but he only managed to gain the support of Massachusetts. This was the first of three unsuccessful attempts at gaining the presidency. In 1840, the Whig Party nominated William Henry Harrison for president. Webster was offered the vice presidency, but he declined. Following his victory in 1840, President William Henry Harrison appointed Webster to the post of Secretary of State in 1841, a post he retained under President John Tyler after the death of Harrison a month after his inauguration. In September 1841, an internal division amongst the Whigs over the question of the National Bank caused all the Whigs (except Webster, who was in Europe at the time) to resign from Tyler's cabinet. In 1842, he was the architect of the Webster-Ashburton Treaty, which resolved the Caroline Affair, establishing the definitive Eastern border between the United States and Canada (Maine and New Brunswick), and signaling a definite and lasting peace between the United States and Britain. Webster succumbed to Whig pressure in May 1842 and finally left the cabinet. In 1845, he was re-elected to the Senate; where he opposed both the annexation of Texas and the resulting Mexican-American War for fear of its upsetting the delicate balance between slave and non-slave states. In 1848, he sought the Whig Party's nomination for President but was beaten by military hero Zachary Taylor. Webster was once again offered the vice presidency, but he declined saying, "I do not propose to be buried until I am dead." The Whig ticket won the election; Taylor died 16 months later. The Compromise of 1850 was the Congressional effort led by Clay and Stephen Douglas to compromise the sectional disputes that seemed to be headed toward civil war. On March 7, 1850, Webster gave one of his most famous speeches, characterizing himself "not as a Massachusetts man, nor as a Northern man but as an American…." In it he gave his support to the compromise, which included the Fugitive Slave Law of 1850 that required federal officials to recapture and return runaway slaves. Webster was bitterly attacked by abolitionists in New England who felt betrayed by his compromises. Rev. Theodore Parker complained, "No living man has done so much to debauch the conscience of the nation." Horace Mann described him as "a fallen star! Lucifer descending from Heaven!" James Russell Lowell called Webster "the most meanly and foolishly treacherous man I ever heard of." Webster never recovered the popularity he lost in the aftermath of the Seventh of March speech. I shall stand by the Union… with absolute disregard of personal consequences. What are personal consequences… in comparison with the good or evil which may befall a great country in a crisis like this? … Let the consequences be what they will…. No man can suffer too much, and no man can fall too soon, if he suffer or if he fall in defense of the liberties and constitution of his country. Resigning the Senate under a cloud in 1850, he resumed his former position as Secretary of State in the cabinet of Whig President Millard Fillmore. Notable in this second tenure was the increasingly strained relationship between the United States and Austria in the aftermath of perceived American interference in its rebellious Kingdom of Hungary. As chief American diplomat, Webster authored the Hülsemann Letter, in which he defended America's right to take an active interest in the internal politics of Hungary, while still maintaining its neutrality. He also advocated for the establishment of commercial relations with Japan, going so far as to draft the letter that was to be presented to the Emperor on President Fillmore's behalf by Commodore Matthew Perry on his 1852 voyage to Asia. In 1852 he made his final campaign for the Presidency, again for the Whig nomination. Before and during the campaign a number of critics asserted that his support of the compromise was only an attempt to win southern support for his candidacy, "profound selfishness," in the words of Ralph Waldo Emerson. Though the Seventh of March speech was indeed warmly received throughout the south, the speech made him too polarizing a figure to receive the nomination. Webster was again defeated by a military hero, this time General Winfield Scott. He died on October 24, 1852, at his home in Marshfield, Massachusetts, after falling from his horse and suffering a crushing blow to the head, complicated by cirrhosis of the liver, which resulted in a brain hemorrhage. His son, Fletcher Webster, would go on to be a Union Colonel in the Civil War commanding the 12th Massachusetts Infantry, but would be killed in action on August 29, 1862 during the Second Battle of Bull Run. Today a monument stands in his honor in Manassas, Virginia, and a regimental monument on Oak Hill at Gettysburg, Pennsylvania. Monument to Daniel Webster located on Scott Circle in Washington, D.C.
Ralph Waldo Emerson, who had criticized Webster following the Seventh of March address, remarked in the immediate aftermath of his death that Webster was "the completest man," and that "nature had not in our days or not since Napoleon, cut out such a masterpiece." Others like Henry Cabot Lodge and John F. Kennedy noted Webster's vices, especially the perpetual debt against which he, as Lodge reports, employed "checks or notes for several thousand dollars in token of admiration" from his friends. "This was, of course, utterly wrong and demoralizing, but Mr. Webster came, after a time, to look upon such transactions as natural and proper. […] He seems to have regarded the merchants and bankers of State Street very much as a feudal baron regarded his peasantry. It was their privilege and duty to support him, and he repaid them with an occasional magnificent compliment." Several historians suggest Webster failed to exercise leadership for any political issue or vision. Lodge describes (with the Rockingham Convention in mind) Webster's "susceptibility to outside influences which formed such an odd trait in the character of a man so imperious by nature. When acting alone, he spoke his own opinions. When in a situation where public opinion was concentrated against him, he submitted to modifications of his views with a curious and indolent indifference." Similarly, Schlesinger cites Webster's letter requesting retainers for fighting for the Bank, one of his most inveterate causes; he then asks how the American people could "follow [Webster] through hell or high water when he would not lead unless someone made up a purse for him?" He served the interest of the wealthy Boston merchants who elected and supported him, first for free trade, and later, when they had started manufacturing, for protection; both for the Union and for a compromise with the South in 1850. Schlesinger remarks that the real miracle of The Devil and Daniel Webster is not a soul sold to the devil, or the jury of ghostly traitors, but Webster speaking against the sanctity of contract. More widely agreed upon, notably by both Senator Lodge and President Kennedy, is Webster's skill as an orator. Kennedy praised Webster's "ability to make alive and supreme the latent sense of oneness, of union, that all Americans felt but few could express." Schlesinger, however, notes that he is also an example of the limitations of formal oratory: Congress heard Webster or Clay with admiration, but they rarely prevailed at the vote. Plainer speech and party solidarity were more effective; and Webster never approached Jackson's popular appeal. Webster has been commemorated in numerous forms: the popular short story, play (and movie) The Devil and Daniel Webster by Stephen Vincent Benét; one of the two statues representing New Hampshire in the National Statuary Hall Collection in the U.S. Capitol building; a U.S. Navy submarine, the USS Daniel Webster; a peak in New Hampshire's Presidential Range, Mount Webster; and a college, Daniel Webster College, located in Nashua, New Hampshire. A reference to Webster is also made in the 1939 film Mr. Smith Goes to Washington; James Stewart's character is amazed to find out that he will be sitting in the same seat that Webster once occupied. In 1957 a senatorial committee chaired by then-Senator Kennedy named Webster as one of their five greatest predecessors, selecting Webster's oval portrait to adorn the Senate Reception Room off the Senate floor. ↑ Henry Cabot Lodge, Daniel Webster (1883), 6. ↑ John F. Kennedy, Profiles in Courage (New York: Perennial Classics, 2004), 59. ↑ H. Lee Cheek, Jr., "Webster, Daniel." In David Schultz, (ed.) Encyclopedia of American Law. (New York: Facts On File, Inc., 2002). ↑ Mary Beth Norton, A People & A Nation (New York: Houghton Mifflin Company, 2005), 228. ↑ WEBSTER, DANIEL (1782-1852). Encyclopedia Britannica, 11th Edition. Retrieved November 24, 2017. ↑ Thomas E. Baker, "Dartmouth College v. Woodward." In Schultz, David, (ed.) Encyclopedia of American Law (New York: Facts On File, Inc., 2002). ↑ Patrick K. O'Brien, (gen. ed.) "Dartmouth College case" Encyclopedia of World History (New York: Facts On File, Inc., 2000); Schlesinger Age of Jackson, 324-325. ↑ Arthur Meier Schlesinger, Jr. The Age of Jackson (Boston: Back Bay Books, 1988, ISBN 0316773433), 12-15. ↑ James Schouler, History of the United States (New York: Dodd, Mead & Company, 1891). ↑ Robert V. Remini, Daniel Webster: The Man and His Time (New York: W. W. Norton, 1997), 761. ↑ The "Famous Five" Now the "Famous Nine". Senate Historical Office. Retrieved November 24, 2017. Bartlett, Irving H. Daniel Webster. 1978. Baxter, Maurice G. Daniel Webster and the Supreme Court. 1966. Brown, Thomas. Politics and Statesmanship: Essays on the American Whig Party. 1985. Current, Richard Nelson. Daniel Webster and the Rise of National Conservatism. 1955. Curtis, George Ticknor. Life of Daniel Webster. 1870. Formisano, Ronald P. The Transformation of Political Culture: Massachusetts Parties, 1790s–1840s. 1983. Hammond, Bray. Banks and Politics in America from the Revolution to the Civil War. 1960. Holt, Michael F. The Rise and Fall of the American Whig Party: Jacksonian Politics and the Onset of the Civil War. Oxford University Press, 1999. ISBN 0195055446. Ogg, Frederic Austin. Daniel Webster. 1914. Schouler, James. History of the United States. New York: Dodd, Mead & Company, 1891. Schultz, David. (ed.) Encyclopedia of American Law. New York: Facts On File, Inc., 2002. Shade, William G. Evolution of American Electoral Systems: The Second Party System. edited by Paul Kleppner, et al. 1983. Smith, Craig R. "Daniel Webster's Epideictic Speaking: A Study in Emerging Whig Virtues"
The works of Daniel Webster, edited in 6 vols. by Edward Everett. Boston: Little, Brown and company, 1853. Wiltse, Charles M., Harold D. Moser, and Kenneth E. Shewmaker (Diplomatic papers), eds., The Papers of Daniel Webster, (1974-1989). Published for Dartmouth College by the University Press of New England. ser. 1. Correspondence: v. 1. 1798-1824. v. 2. 1825-1829. v. 3. 1830-1834. v. 4. 1835-1839. v. 5. 1840-1843. v. 6. 1844-1849. v. 7. 1850-1852—ser. 2. Legal papers: v. 1. The New Hampshire practice. v. 2. The Boston practice. v. 3. The federal practice (2 v.)—ser. 3. Diplomatic papers: v. 1. 1841-1843. v. 2. 1850-1852—ser. 4. Speeches and formal writings: v. 1. 1800-1833. v. 2. 1834-1852. The works of Daniel Webster…. 6 vol, 1853 edition. Univeristy of Michigan. The private correspondence of Daniel Webster ed. by Fletcher Webster. 2v 1857 edition. Daniel Webster at Find A Grave. Full text of Daniel Webster by Henry Cabot Lodge from Project Gutenberg. Students' Series of English Classics: First Bunker Hill Oration. (a) The Whig Party ran regional candidates in 1836. Webster ran in Massachusetts, William Henry Harrison ran in the Northern states, and Hugh Lawson White ran in the Southern states. (b) Daniel Webster died on October 25, 1852, one week before the election. However, his name remained on the ballot in Massachusetts and Georgia and he still managed to poll nearly seven thousand votes. This page was last modified on 26 November 2017, at 20:50.